Omnitrope or Somatropin (rDNA origin) is a human growth hormone (HGH) that is created by the manufacturing company Sandoz. It is made to be an exact replica of the growth hormone (GH) that the body already produces. It is a 191 amino acid sequence, large protein molecule that is very sensitive to light, movement and temperature. It is only to be used as a subcutaneous injection and must be prescribed by a licensed physician. There are very strict guidelines that are set up by the US government pertaining to the distribution, sale and use of Omnitrope. It is considered to be a controlled substance. Those who misuse or abuse this medication can have serious medical consequences, but they can also get heavy fines and even jail time. Using Omnitrope without a prescription is breaking the law. Patients must be tested by professionals in order to see if they are dealing with a growth hormone deficiency before they can legally purchase this medication. It is a simple blood test that will determine if a deficiency is present or not. In addition, patients must get a physical examination and fill out a medical history form. Our doctors will analyze all test results to determine if a patient’s health is good enough to be on a hormone replacement therapy (HRT) program with Omnitrope. Omnitrope is indicated for use with adults over 30 who have been determined by a medical professional to have a bona fide growth hormone deficiency. Omnitrope can only be prescribed for GH deficient adults who are over 30. Why over 30? Experts in the field of endocrinology consider this to be the age when growth hormones will start to deplete. However, this must be proven by patients getting a blood test. The blood sample will show that they have a bona fide growth hormone deficiency due to growing older. The blood test will also give a doctor a good indication that the symptoms that the patient is experiencing are most likely being caused by growing older. This is because the pituitary gland slows down its production of the vital hormone. A physical exam is mandated too and will show a doctor whether or not a patient is in good enough health for HRT. When a patient starts to become tired, depressed, heavier, forgetful, sick more often, less physically attractive (looking older) and other classic symptoms of aging start occurring, this could be due to low GH levels. When given at the right dosage, Omnitrope levels can gently rise and balance out. When this happens, a patient will notice that they are feeling more energetic, happier, more emotionally stable and have more strength, good health on all levels and feel better about their future. Omnitrope can be taken via two different delivery methods. Patients can use traditional needles and syringes or more innovative pens. Every client will receive specific instructions on how to use each method step by step when the time comes to self administer the medication. There are even online videos that our advisors will share that teach patients how to reconstitute and prepare their solutions from vials for their shots. The videos will also show how to administer the medication into the body. Omnitrope also comes in pens. These are most convenient and easier to use than vials with syringes and needles, but still, a patient has a choice. Both the Omnitrope Pen 5 and the Omnitrope Pen 10 were created to give HRT patients an easy to learn and easy to use way of delivering their human growth hormone medication. These pens just need their cartridges to be primed before using for the first time. Patients will set their prescribed dosage on the pen and it’s ready. It really is that simple. Of course, every client will get complete, detailed instructions and assistance from their clinical advisor before using their pen. Omnitrope medication has remarkable benefits and that is why it is so popular for use with HRT. It must be used properly with the proper medical care and patients can reach their goals in no time at all. As you can see, there are many benefits to using the HGH medication Omnitrope. The kinds of benefits that a patient will receive from treatment will be based on body chemistry, body composition, symptoms from low GH and other factors. When using the medication Omnitrope properly, side effects are rare. In order to have a better chance of not having any side effects from this medication, a patient must follow his or her prescription exactly as directed, follow through with their medical supervision and live a healthy lifestyle. *Please understand that some side effects may seem minor; however, they should never be ignored. If a side effect is not attended to properly, it could get worse and turn into a major side effect with serious consequences. If a patient feels anything out of the ordinary occurring during treatment, they should call us or get medical attention immediately. Make sure that you attend to any side effect immediately. Do not ignore them. Even minor side effects can get worse or something more serious can happen later on if medication is still taken. Do not take that chance. Either call us or visit your local emergency room if you feel something occurring that is out of the ordinary. Take care of your health properly. In order to avoid the uncomfortable and sometimes dangerous side effects of Omnitrope, a patient should following their doctor’s prescription and treatment plan exactly as it is written. It is never advised to use any human growth hormone medication from an unknown source and always make sure you are working with a reputable clinic. Taking responsibility for your health is how you will stay safe and protected when on an HRT program. Be sure that you are receiving proper medical supervision and always report any side effect that may occur. Side effects may occur when a patient has an allergic reaction to the medication or if they are using medications that are tainted, impure or fake. Avoid inauthentic medication usage by only using them from a clinic that is very well known and that has a successful track record. The clinic you work with should always offer a first free consultation. This is when you will get to know your clinical advisor and vice versa. You will learn about hormone replacement therapy, how it works and if it is right for you. Advisors will ask questions about your symptoms and your goals for therapy too. Together you can decide if you will move on to the next step. Clinical advisors will be with the patient for the entire length of therapy. The clinic you work with should require testing to be done. This is the second step after your first phone consultation. The advisor will set your appointment up for you with a clinic in your local area. You will receive a blood test and a physical exam. In addition, you will be required to fill out our online medical history form. The clinic you work with should only have physicians with the highest training in the field of endocrinology or a closely related medical field. Doctors should be fully licensed. They can accurately diagnose, prescribe, write treatment plans and provide medical supervision. Medications used by the clinic should always be of the highest quality. They should be made in the USA, 100 percent pure and real. Patients need to check their medications before using them. You are looking to make sure that the solution is pure and completely clear. Never use a medication that has particles in it or that looks murky or cloudy. Never work with clinics that are not known. Never work with clinics that you find on websites that do not give you the information that answers all of your questions about HRT. Use your gut feeling about whether or not a clinic is honest and trustworthy. Your first consultation with an advisor will be all telling. In other words, you will find out everything you need to know before you take Omnitrope. You will learn how to start a treatment program and the steps you need to take to get a prescription for Omnitrope safely and legally. Every patient is unique with different symptoms from low growth hormone levels and varying body chemistry. They will have different needs. Therefore, there is not only one dosage that everyone takes. A doctor can very accurately prescribe the right dosage for you after they read your test results and medical information. When self administering Omnitrope either with needles and syringes or with pens, it will always be delivered just under the skin. This is called taking the medication subcutaneously. It is never to be injected into a muscle or directly into a vein. There is a certain way that the experts suggest that patient care for and store their Omnitrope pens. Omnitrope should be stored in the refrigerator in its refrigerator box or its storage pouch. The reason for this is to protect the medication from light. The temperature of the refrigerator should be between 36° F and 46° F, never put into heat or frozen. Patients are told to only keep the Omnitrope cartridge for a maximum of 28 days after the first injection and then it should be discarded. 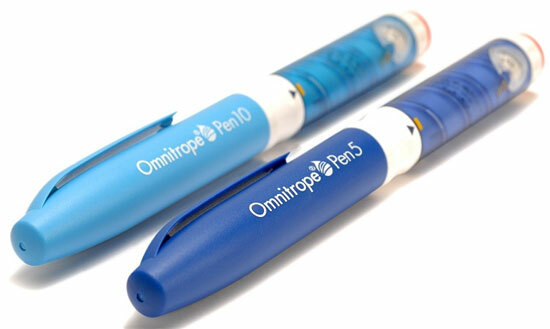 The Omnitrope ® Pen 10 can be reused many times by just replacing the cartridge with a new one. Wash the pens with a damp cloth of only water. Never use chemical detergents or anything but water to clean them.